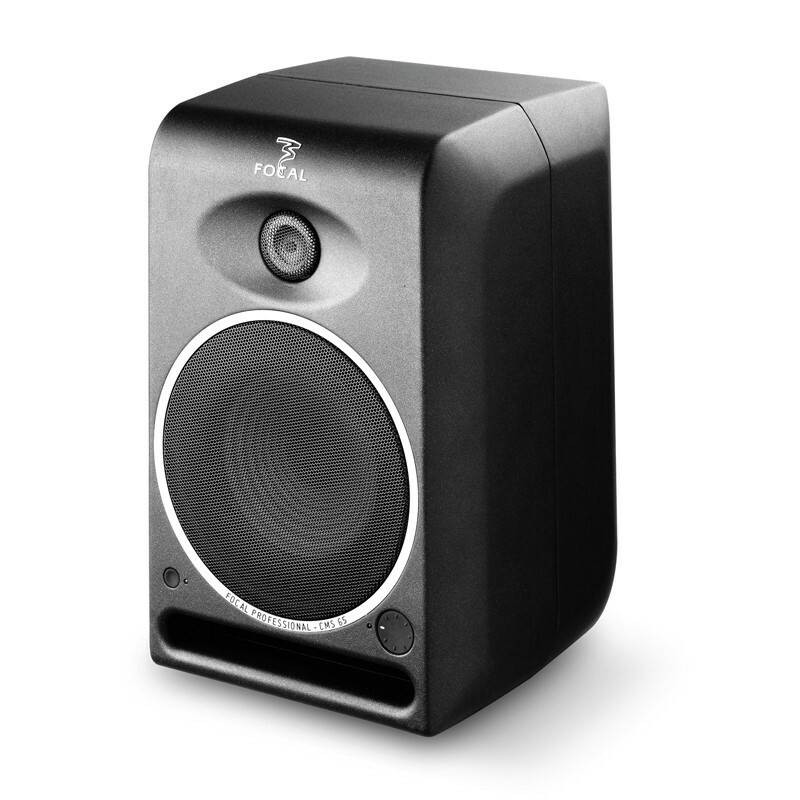 Award-winning mid-to-nearfield monitor from pioneering French loudspeaker manufacturer Focal, the CMS 65 has consistently received rave reviews from press and users alike, which is not surprising since it shares many features with the vastly more expensive Focal SM line of monitors. More of a midfield monitor, CMS 65 is the reference standard of he CMS line. The 6.5” mid-bass reaches down to 45Hz, which for almost all applications is going to be perfectly acceptable without needing to use a separate sub unit. CMS 65 is characterized by treble definition, midrange transparency and adjustable control of the midbass and bass registers. The tonal balance is extremely stable, even at very loud volumes, ensuring accurate reproduction when mixing and mastering. A two-way active design with a letterbox front port, this powered monitor delivers an impressive sound from its 100w low freq / 60w high freq biamped system. Unlike 90% of loudspeaker manufacturers, Focal actually designs and builds all its own components. Notable on the CMS series is the inverted dome tweeter. Advantages include the optimization of the mechanical coupling between the voice coil and the dome. The voice coil is fixed at mid-height on the dome and uniformly moves the cone entire surface. The positive dome is only joined at its edge, causing it to be inactive beyond 16kHz for a flexible surface. The inverted dome directly radiates into the air, with maximum efficiency, which is translated by an extremely precise soundstage. The dome’s response curve is clearly more linear than that of any positive dome. It provides better space dispersion and very low directivity, contrary to ribbon tweeters. The inverted dome tweeter offers unequalled dynamics, enabling sound engineers to very precisely control compression. The 6.5” woofer can handle low end with ease and grace and the Polyglass cone delivers both punch and exceptional clarity. The large front port lets you wall-mount the CMS 65 from without any loss of control in the bass register. Fixing accessories are available from Focal if you need to hang your monitoring system but the monitor’s fixing points are also compatible with K&M and Omnimount kits. The cabinet constructed from reinforced and dampened Aluminum, with a black powdered finish, the CMS 65 looks - and is - modern, tough and stylish. Inside, the aluminum/magnesium tweeters combine great damping qualities with great rigidity both of which greatly reduce distortion. This unique marriage of metals offers several advantages. The impulse response is incredibly rapid yet benefits from a very short settlement time and excellent damping. This enables the tweeter to extend its frequency response beyond 28kHz (-3dB).